German factory orders bounced back in December, signaling a recovery in eurozone demand that could help Europe's biggest economy avoid a recession. After a sharp 1.8% decline in November, orders were up 0.8% last month, thanks to a 7% increase from Germany's eurozone partners. "These are positive signs for the development of industrial production this year," Germany's economics ministry said in a statement. "Together with the improvement in business climate seen in recent months, these early indicators signal an end to weakness in the industrial sector." Germany is one of the world's top exporters after China and it accounts for nearly 30% of eurozone gross domestic product. 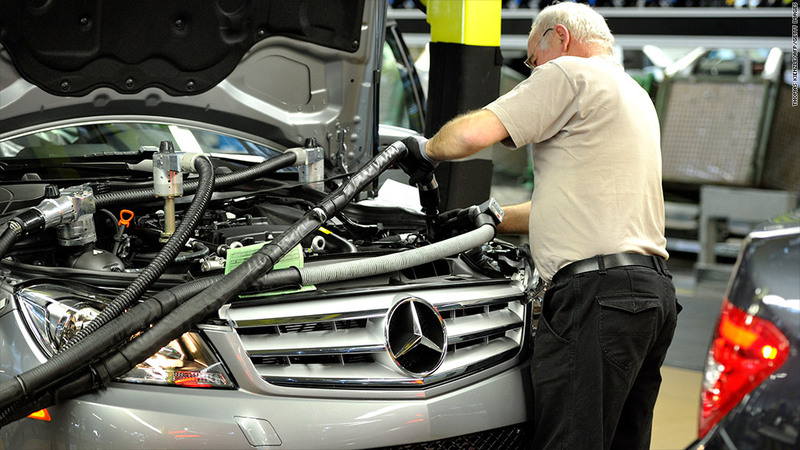 A recovery in eurozone demand for German goods may signal the worst is over for the 17-nation currency area's economy, which is poised for a second consecutive year of contraction in 2013. The German economy shrank by about 0.5% in the final quarter of 2012 as the debt crisis gripping southern European states depressed demand for exports and prompted companies to delay investment decisions. German economic growth in all of 2012 was 0.7%, the weakest performance since the depths of the financial crisis in 2009 and below the country's 10-year average of 1%. The country's central bank warned in early December that a recession was possible, given a weak outlook for the start of this year. However, surveys have since pointed to rising business confidence despite the prospect of stagnation in much of the rest of Europe, at least until later this year, and recent gains in the euro against other major currencies. Orders from countries outside the eurozone fell 0.4% in December, which could be reflecting a loss of competitiveness due to the euro's strength. Orders for German capital goods from the rest of the eurozone shot up by 11.6% in December. Domestic orders fell 1.2%, driven by a decline in demand for consumer goods.